Networking is a way of conducting business which is as old as business itself! It exists in various forms and the changes of the modern world have had very positive effects on the practice. Networking is an effective way to market an art business and it must not be overlooked. Networking in its most basic form is a chance to meet with like-minded business people to share ideas and information. This is particularly valuable if you are part of a network comprising solely of art businesses. If your networking activities include non-art businesses, this is also very worthwhile. Often views from outside the world of art are refreshing and innovative. One of the best reasons to network is to swap business contacts and generate referrals. This works as a two way relationship. For example, let’s assume you need some electrical work at your gallery or studio. There will most likely be a self-employed electrician in your networking group. You would automatically offer the work to him, hopefully receiving a good discount in the process. Having generated income for the electrician, he will be duty-bound to direct work towards you, should he find such an occasion. This may be in the form of a commission or a sale, for example. If he works in the private business sector, maybe he can generate income for you on the basis of corporate art or art rental. Finally, never underestimate the value of friendship within a business context. We are human beings first and business people second! There are many different types of networks to choose from and one or all of them may suit you. Networking groups are often set up for pre-arranged breakfast and lunch meetings. These are a chance to socialise, arrange referrals and appointments as well as advertise your skills. Sometimes the meetings even have guest speakers or some form of entertainment. The meetings are helpful to create bonds through shared experience. Online networking is a huge phenomenon socially. The same success can be transferred to business networking. Plenty of networkers use the services of sites like LinkedIn and Facebook. The next big things are also blogs (online web diaries and observations) and Twitter which is a similar, although more concise and immediate idea. Exclusive business syndicates are highly successful groups where only one example of each trade, business or skill is represented. This maximises the possibility of generating business for members. Don’t forget the basic methods of networking. Wherever you go, make sure you carry business cards. Even the most unlikely social occasions can unearth interesting contacts and opportunities. Networking sounds like a mysterious and complicated process. However, it is the simple and ancient practice of using social links to ensure your wellbeing. Every day presents new chances to network and you need to fine tune your ability to spot these occasions. 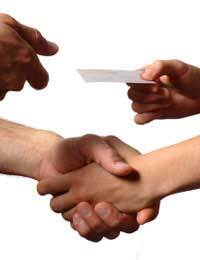 Networking will ensure that from a single deal, new business transactions will appear as your web of contacts expands.